‘Had I been too hasty? I used to ask myself; and this question would occur with a cruel sharpness after some brief chance interview with Dr. John. He still had such kind looks, such a warm hand; his voice still kept so pleasant a tone for my name, I never liked ‘Lucy’ so well as when he uttered it. But I learnt in time that this benignity, this cordiality, this music, belonged in no shape to me: it was a part of himself; it was the honey of his temper: it was the balm of his mellow mood; he imparted it as the ripe fruit rewards with sweetness the rifling bee; he diffused it about him, as sweet plants shed their perfume. Does the nectarine love either the bee or bird it feeds? Is the sweet briar enamoured of the air? These lines extracted from the novel ‘Villette’ are amongst the most poignant I have ever read. They are directed from ‘Lucy’ (a character strongly representing Charlotte Bronte) towards ‘Dr. John’ (her real life publisher and object of love George Smith). As mentioned in an earlier post Villette chronicles Charlotte Bronte’s early experiences as a student/teacher in Brussels. In 1842 Charlotte and her sister Emily embarked upon the journey to Brussels with the intent of learning languages; French Italian and some German, all of which would, the sister’s hoped, give them a competitive advantage when they returned to set up their own school in England. In exchange for lodging and lessons delivered by Constantin Heger at the Pensionnat, Charlotte taught English at the same boarding school and Emily music. Interaction with M. Heger provided deep intellectual stimulation for Charlotte, and lay the foundation for the strong feelings she came to harbour for him. M. Heger was a married man, and while he was solicitous of the welfare of both sisters, and deemed them to be no ordinary students, Charlotte’s feelings for him were not reciprocated. It is extremely unlikely that Charlotte sought a romantic liaison or affair of sorts with him, but in reading her frenzied and ardent letters to him, he was aware that her feelings had extended beyond the purely platonic realm. He consistently refused to reply to the letters she subsequently wrote on her return to Yorkshire, for fear that it might constitute encouragement. Constantin Heger is the irascible and irrepressible ‘Paul Emanuel’ of Villette, cantankerous and difficult to get along with, and yet possessing some sterling good qualities. Heger has been of sustained interest to Charlotte Bronte’s biographers, and they have devoted considerable space to investigating the nature of her association with him. One commentator has even deemed that Charlotte’s time in Brussels’ amounted to “the greatest single emotional experience of her life.” (2) I am inclined to take issue with this identification of M. Heger as the primary and most important love interest in Charlotte Bronte’s life. She probably did love him; Prior to Brussels she had lived a somewhat isolated existence, and he was the first man to leave a forceful intellectual impress upon her mind. However, while Villette, in a sense documents her contrary feelings towards Heger; her mingled respect and disdain, warmth and utter exasperation towards him, the novel is also a testament to her deep and passionate love for ‘Dr John’ or rather George Smith, her publisher. While biographers are obliged to comment on Charlotte’s association with Smith, the relatively little attention devoted to him is indeed surprising, given the strength of feeling ‘Lucy Snowe’ evinces for him and the directness with which this is expressed. ‘Dr. John’ as portrayed by Charlotte Bronte in Villette possesses a highly attractive personality. There are over a dozen allusions in the novel to how handsome and physically prepossessing he is, but more than that he is a thoughtful, feeling, talented and benevolent man. When you read the novel, it’s pretty clear that Charlotte Bronte was crazy about this guy. 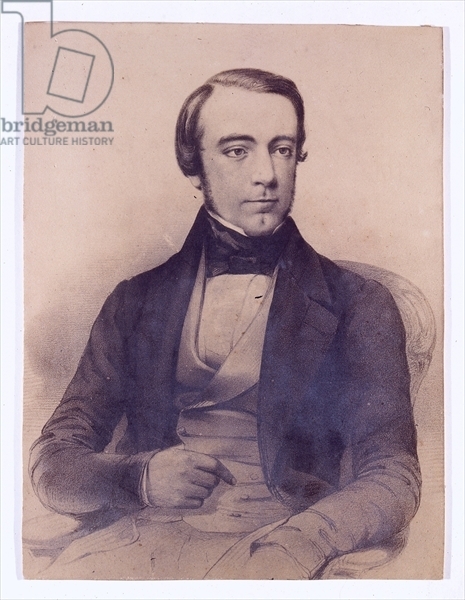 He and his mother Mrs. Louisa Bretton (a faithful representation of George Smith’s mother Elizabeth Smith) have braved considerable material adversity and Dr. John is a rising physician also living and working in Villette (Brussels). Louisa Bretton had acted as Lucy’s God-mother when the latter was a girl of fourteen, and Lucy has accordingly known both mother and son from childhood. Circumstances throw them apart, and Lucy is again acquainted with Dr. John nine years later when his services are secured by Madame Beck (the directress of the boarding school where Lucy is employed as English teacher). He fails to recognise her, but she soon enough identifies him as the ‘Graham’ of old. It is evident that Lucy has very strong feelings for him, but she never allows herself to fully express these sentiments; the prospect of their being together is remote, and (she feels) almost ludicrous. Charlotte Bronte remained acutely conscious of her unprepossessing exterior throughout her life, and Lucy Snowe is the medium through which these entrenched insecurities find expression. If you think about it, it is quite extraordinarily that Villette was written and published at all, given the content it contains. It is an open declaration by Charlotte of her love (indeed passion) for her publisher, love which she knows is not requited (certainly not to the same extent). Smith obviously had regard for Charlotte (a distinguished author and literary genius) but whether he felt anything approaching love is open to question. Villette is in a large part a study and glowing delineation of George Smith, and was forwarded by Charlotte for publication by him. In Charlotte’s circle of literary friends and acquaintances ‘Dr. John’ and ‘Louisa Bretton’ could very easily be identified as George Smith and his mother. Hence Charlotte’s request that the novel be published anonymously. (5) This request was declined as the name of ‘Currer Bell’ (Charlotte Bronte’s pseudonym) was required to generate the requisite interest in the novel and assure sales. I also subsequently learned that Charlotte Bronte’s belief that her looks posed a serious hindrance to prospective marriage with Smith, was not without foundation. It is questionable as to how far we can take this communication at face value. I do not believe Smith when he says ‘I was never a coxcomb enough to suppose that she was in love with me”. That Charlotte was in love with him is plain enough; Villette is a powerful testament to this fact. Was he indeed romantically indifferent to her, their relationship being a “curious one-sided friendship which was half marble and half life; only on one hand truth and on the other perhaps a jest”, as suggested by Bronte in Villette? There is his insistence in 1850 that Charlotte accompany him and his family on a trip to the Rhine, a proposal which was met with resistance by his mother. (7) There are also, in the written exchanges between them, fragments suggesting that at one stage he had seriously contemplated proposing to her. This was shortly after she declined to accompany his family to the Rhine (chiefly citing her health as the reason), and it is suggested by Sir Tresham Lever, that he was at this point on the brink of proposing to her, but lost his nerve. Parts of their correspondence (some of which was conspicuously withheld by Smith’s family members from subsequent publication) indicates that this was a distinct possibility. (8) All of this precedes Villette, the bulk of which was not written until mid 1852, in which he would have received a very clear indication of her feelings towards him. © Silver Ambrosia. Unauthorised use and/or duplication of this material without express and written permission from this blog's author and owner is strictly prohibited. Excerpts and links may be used, provided that full and clear credit is given to Silver Ambrosia with appropriate and specific direction to the original content.